In today’s BYOD environment, employees are increasingly expecting to be able to access internal web apps from their own personal iOS or Android devices, which are generally not under enterprise management. Many organizations expose these internal web apps only through on premises WiFi or over VPN via managed devices. As mobile web use increasingly eclipses desktop web access, organizations have added mobile support for internal intranet web apps, but face the challenge of exposing these intranet web apps over the internet. One option is to build separate mobile apps to access the same internal resources, an expensive option to develop each web app for each mobile platform. However, using a customized secure browser app allows you to provide the same web app capabilities to the mobile end users, with the requisite levels of security & end user experience. For example, let’s consider a Paid Time Off web app, that employees can use to request PTO. 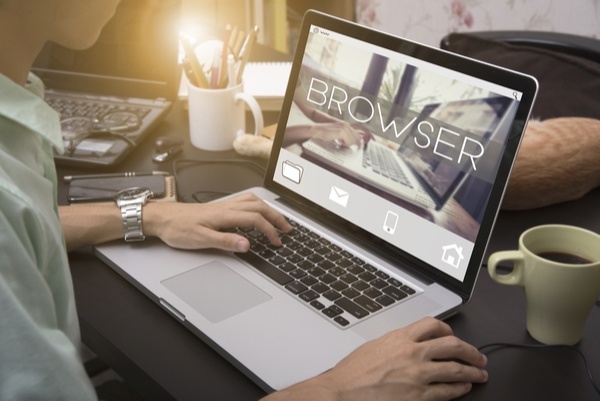 The first step is to use Blue Cedar’s Secure Microtunnel policy so that Blue Cedar’s Compass browser app has network access to the enterprise. Next, we’ll use the Blue Cedar Browser Configuration policy to lock down the app so that it launches directly to the PTO tool’s address and cannot be used for generic browsing. Finally, we’ll use the App Customization policy to customize the look and feel of the app, to make it reflect the organization’s branding guidelines. 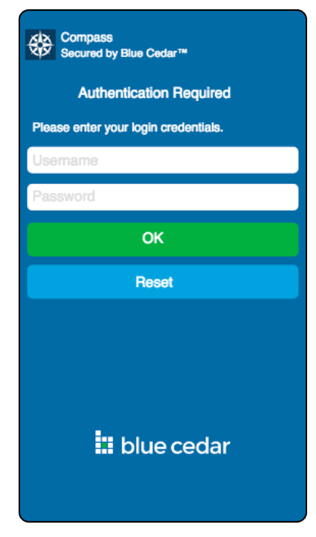 Any app integrated with the Secure Microtunnel policy connects to the Blue Cedar appliance, deployed at the enterprise edge. 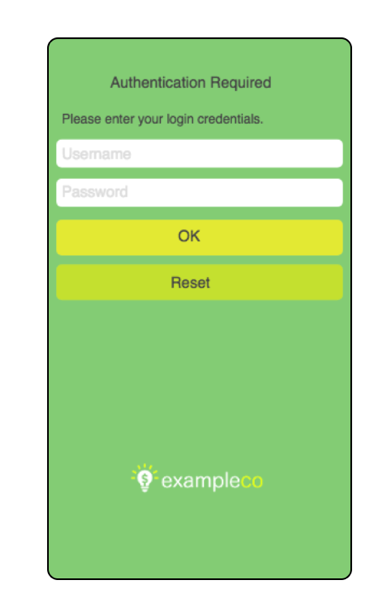 After a one-time enrollment, connecting apps are issued a unique certificate that is used to authenticate to the appliance. 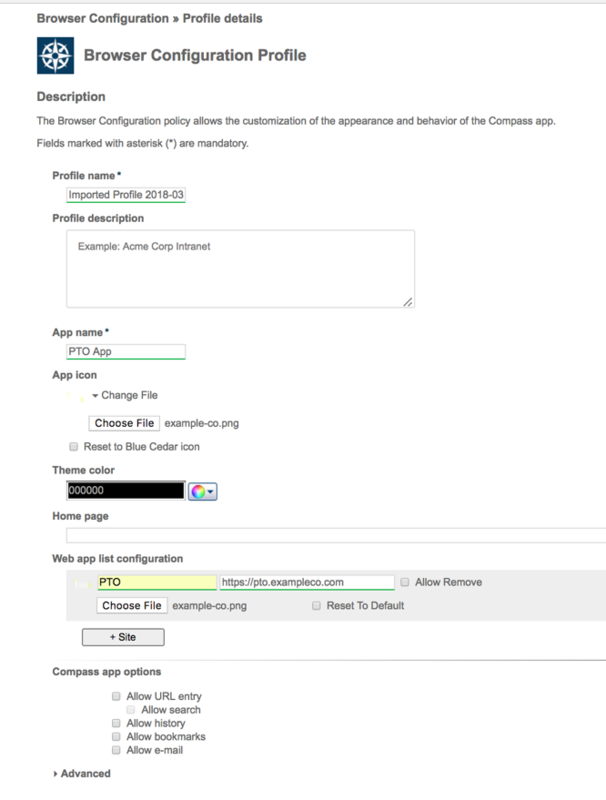 The app is assigned an IP address from the enterprise network through the integration of a TCP/IP stack and secure IKE/IPSEC connectivity directly into the application. Blue Cedar Enforce intercepts network traffic at both the HTTP and TCP/UDP layer and redirects it through our own secure networking stack. This means that internal web app backends do not need to be exposed at the corporate edge. That is all there is to it. With the click of a button, we can now integrate these changes into the Compass app. The process of integration modifies the original IPA or APK files, rewrites the bootstrapping portion of the code to initialize Blue Cedar tech, and injects any additional assets such as the customization logo above. From our example earlier, we can now distribute our new PTO access app to iOS and Android users across the organization – all without writing a single line of code. You can learn more about the power of the Blue Cedar solution by signing up for a personalized demo. Don't wait, sign up today.